A thirsty heart longs to be satisfied. Be careful what you pour into it. No one likes to be physically ill. When we are, we are anxious to be well again. We do not like or care for the way we feel when we are suffering from a physical ailment. Likewise, no one likes to feel emotional distress. When we do, we seek ways to 'feel better'. Even though I am not a medical doctor or a psychologist, I believe it is safe to say that we suffer more emotionally than we do physically. I also believe that we suffer more often emotionally, than we do physically. I make that claim, of course, based upon my own experiences and observations. I do not believe a degree of any sort is necessary to acknowledge that, when we are reasonably physically healthy, our focus is on our emotional well-being. Learning how to become emotionally content is a trial-and-error process. Part of that process includes learning that we are not always going to succeed at feeling good about ourselves and our environment. Emotional contentment is often fleeting at best and sometimes ever more difficult to recapture and maintain. This can often lead to much frustration and an enhanced effort to attain what sometimes seems beyond our reach. As a result, we try practices and methods that we intrinsically know not be wise, and take risks that we would not have taken before. In the process, we comfort ourselves with such notions and justifications as, "it doesn't hurt to try" and "nothing ventured, nothing gained". Sometimes we immediately realize our folly and back away from the fire before we are consumed. Other times, we fail to realize how injurious our pursuit of pleasure has become, and the extent of the harm we are causing not only ourselves, but also our friends and family. If we have succumbed to the tantalizing potions and spells we have been consuming and practicing, we may find ourselves unable to cut ourselves off from the supply line. Eventually we come to realize that we have become caught up in a web of deceit from which are unable to untangle ourselves. Realizing our hopeless plight, we give in to our predicament and fall ever deeper into the dark abyss from which there is no escape without supernatural strength -- strength that we do not have nor can muster on our own. Where we used to say, "I'm good" we now declare we are no good and long for someone or something to put us out of our misery. At the pinnacle of our despair, we become aware of a subtle presence deep within us. As we pay more attention to it, we begin to recognize it. It seems somewhat familiar, like an old friend we once knew but fell out of touch with. We attempt to draw nearer to this familiar presence, and as we do, we begin to feel the unconditional love and forgiveness that we have long desired and sought. We used to be afraid of it. Afraid to trust it; afraid it might not accept and love us with all our imperfections. But now we so desperately long for just such a presence in our life and in our heart. So we reach out for it with complete abandon, forsaking all else. In the process, we come to realize that the One who gave us life, desires to heal and restore us. To mold us into His image for us. To give us a new life and a new purpose. To help us realize just how deeply He loves and values us, His children. What joy there is in coming to know the One who created us to be with Him. What peace there is, no longer having to wonder, "what am I here for and what is the purpose of my life?" 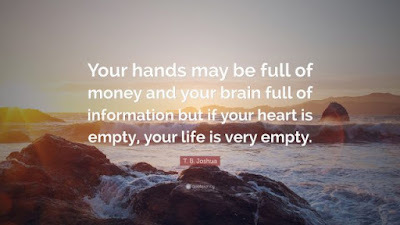 As our heart and spirit become one with His, we discover that everything we truly wanted and desired, was always available to us, in and through Him. All we needed to do, was to let go of everything the world had to offer, and accept His design for our life. In so doing, He pours out blessing upon blessing, so that even in the tough times we can be still and know, HE IS GOD. THANK GOD from whom ALL BLESSINGS FLOW for His great faithfulness to us, even when we thought we wanted nothing to do with Him. Without Him, our lives and hearts are empty shells on the seashore of Creation.